The Reolink Argus is their latest completely 100% wire-free security camera. It’s powered by batteries and connects to your WiFi so you can place it anywhere you want indoors or outdoors, and not have to worry about running any wires at all. Use your smart phone to access the camera and its live or recorded 1080p video at any time. Keep reading this Reolink Argus Review to see the good and bad points of this little camera, and why it gets a thumbs up from me overall. So easy to setup that the camera can talk you through it! The camera ships with a printed Quick Start Guide, but once you get the batteries installed the camera starts talking to you and tells you what to do next to get it setup. There are only a few simple steps to do using your smart phone, and your new Reolink Argus camera is up and running. I used my Nexus 5X and it worked perfectly, the entire setup process is very innovative and as simple as it could possibly get. Install the Reolink App on your iOS or Android mobile device. Add your camera to the app by scanning the QR code on the back of the camera. Tap ‘Setup Camera’ in the app and select your Wifi SSID, and enter the Wifi password. Now point the camera at the QR code shown on your phone screen so the camera can read it. All that’s left is to set a password for the camera and you’re done! Here’s what you get in the box, all well packaged to arrive safely. 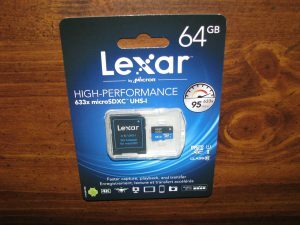 Tool to help open cover and insert & remove microSD card. You can place this camera almost anywhere, and easily move it around if needed. The magnetic base is really easy to use and makes it simple to position the camera how you want. The dome-shaped top of the base is steel inside and coated with a rubbery material and was obviously well though out. The actual magnet is on the bottom of the camera and is a recessed ring that’s strong enough to securely hold the camera to the base or most any ferrous object, yet also easy to adjust to the position that you want. 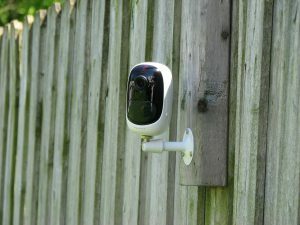 For more permanent installations you might want to use the included outdoor mount that has a clamp to lock the camera into position. This mount also has a wider adjustment range than the magnetic base. You can even mount the camera hanging upside down from the ceiling! There’s an option in the camera settings to flip the image orientation if you do this. It’s IP65 weather rated so you can place it outdoors as well as indoors. On the side of the camera there is a rubber cover that seals the opening for the microSD slot and reset button, which is recessed behind the rubber seal. Simply lift the seal and use the included plastic tool to easily insert or remove the microSD card, or the included steel pin to press the reset button if needed. Most users will insert a microSD card when they first setup the camera and then never need to access that area again. The plastic tool also makes it easier to remove the back cover to install fresh batteries when needed. Simply press it against the latch button and twist the tool to lift the rear cover. The rear cover has a rubber gasket all around the edge creating a water tight seal. 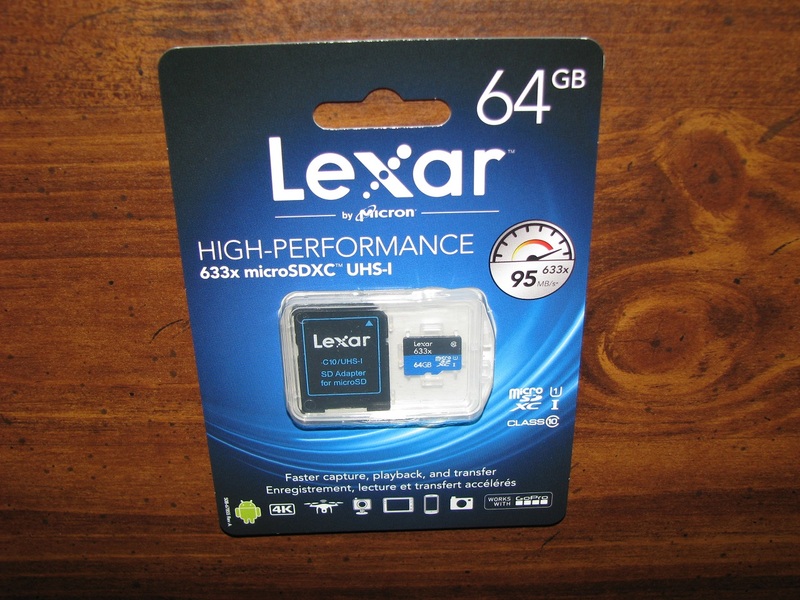 I am using the Lexar 633x 64 GB microSD card with my Argus and it’s been flawless. The Reolink Argus is powered by four CR123A batteries and these can be the standard Lithium batteries, or a rechargeable type if you prefer. 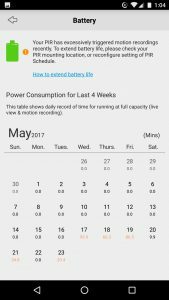 Typical life for a new set of batteries is 180 days in standby mode, or 800 minutes of actual live or recorded video. These batteries keep the size of the camera small and allow it to be used without any wires to an external power supply, but the trade-off is that it is not designed for 24/7 continuous recording. 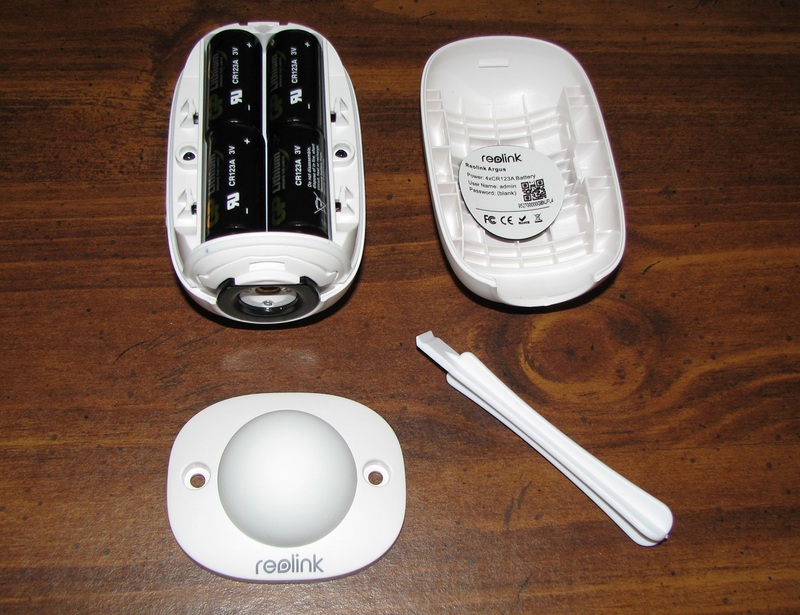 Reolink has this document available to help you get the most life out of your batteries. 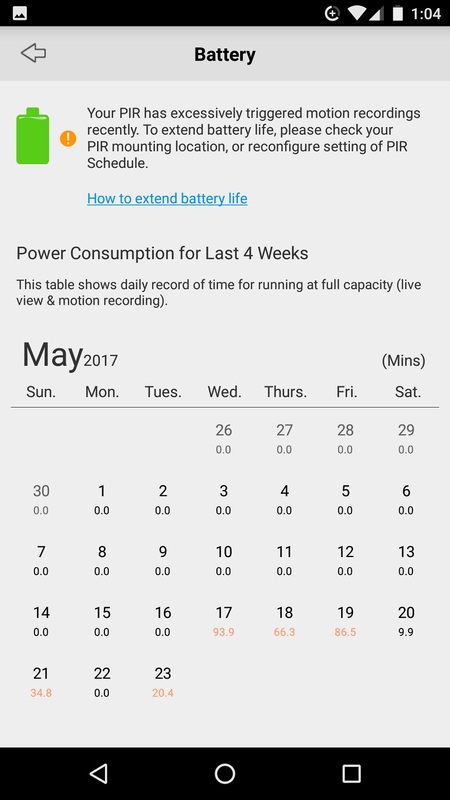 There is a screen within the Reolink App to show you how quickly draining the batteries that shows you these tips as well. The camera will notify you when the batteries are getting too low so you can replace them before they go dead. High speed wireless connectivity to your existing WiFi network. Select your WiFi SSID and enter the password, and your Reolink Argus is on the network and ready to use. No special wireless base station needed like with some other wireless cameras. I have it working outside at 100′ away from my wireless access point through two walls, and the WAP still says 93% signal strength from the camera. This is where the real power of this little camera comes alive, and you can configure it to behave however fits best with your situation, changing it on the fly whenever you want with the app. 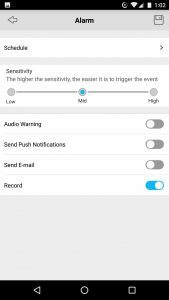 One thing to note that I discovered on my Nexus 5X Android phone that seems to be common on many Android devices. After manually saving several video clips ans snapshots I could not find them in the Reolink folder on my phone until I rebooted the phone. I researched this a bit and it seems to be an issue with Android and not the Reolink App. You see the app saving to storage/emulated/0/reolink on the phone’s internal storage but you can’t actually access those files there until you reboot the phone. The camera normally sleeps in standby mode to conserve battery power, but the PIR (Passive InfraRed) motion detector is always watching for activity unless you schedule it to ignore activity during specific times or days. You can configure the camera to any or all of the following things when motion is detected. The sensitivity of the motion detector is adjustable to prevent false alarms. I tried all of these functions and they all worked well for me. The camera can see in complete darkness thanks to six small IR LEDs built into the face of the camera. If motion is detected to turn on the camera, and it’s dark enough in the area, these lights come on to allow the camera to see in the dark. These are 850 nm lights that work to around 33 feet away, and the camera does work well with external 850 nm IR lights too if you use those. The benefit of a wide angle lens like this is that it allows you to place the camera in a small room and cover almost everything from wall to wall. Perfect for indoor use, porches, doorways, etc. where you’re covering a small area that’s relatively close to the camera. It’s also great for covering a wide area outdoors or in a large area, but the downside is that the lens is so wide that you’re trying to cover too much area. A very wide lens like this makes distant objects look small and not have any real detail. I think that this will not be a problem for most people because a wide angle lens is desirable for most uses of this type of a camera. You can access the camera at any time to view live video and audio from the camera, and choose to prioritize bandwidth efficiency or video quality. Select the Clear stream for higher quality 1080p (1920 x 1072) video at up to 15 frames per second when you’re connected through WiFi or a faster cellular network. The maximum bit rate can be set from 256 to 2048 kbps. Select the Fluent sub-stream to save network bandwidth and get Q720p (640 x 352) video at up to 15 frames per second, such as when your using a slower cellular connection. The maximum bit rate can be set from 64 to 512 kbps. 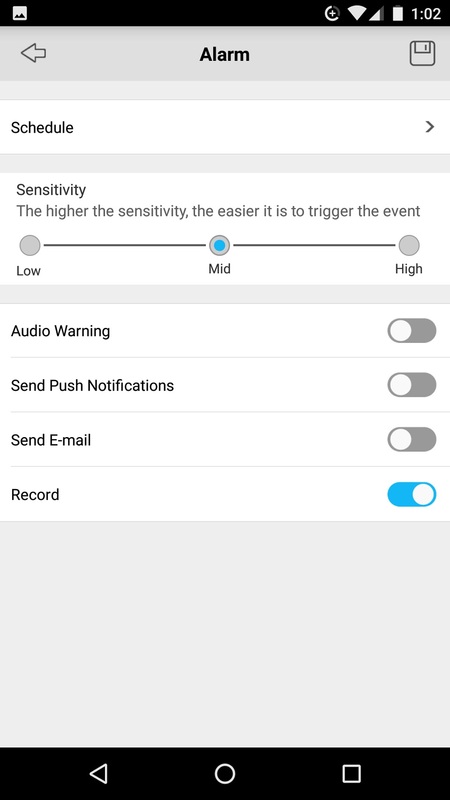 The app shows you a timeline indicating when motion was detected causing video and audio to be recorded. You can select a specific time to watch, or just start it playing and it will show you all recorded video clips one after another. You can choose whether to use Clear or Fluent streaming with recorded video, just like with the live video. Keep in mind that this camera isn’t designed to constantly record video. It’s designed to be small and 100% wire-free, which limits how it can be used in order to extend battery life. You may also want to be careful not to place the camera where someone can grab it and walk off. Be aware of the extremely wide angle lens that I mentioned above. Not a problem for most people but something to keep in mind. 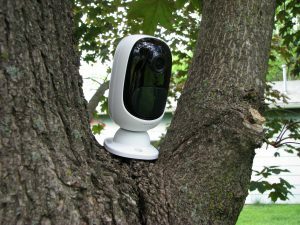 Besides those small things that are really part of the design, I couldn’t find any real problems as I try this camera around my house and yard. As long as you keep in mind the things I mention above to watch out for, this is a great little camera with a lot of potential uses. You can place it almost anywhere there is a WiFi signal, like even in a tree in your yard! 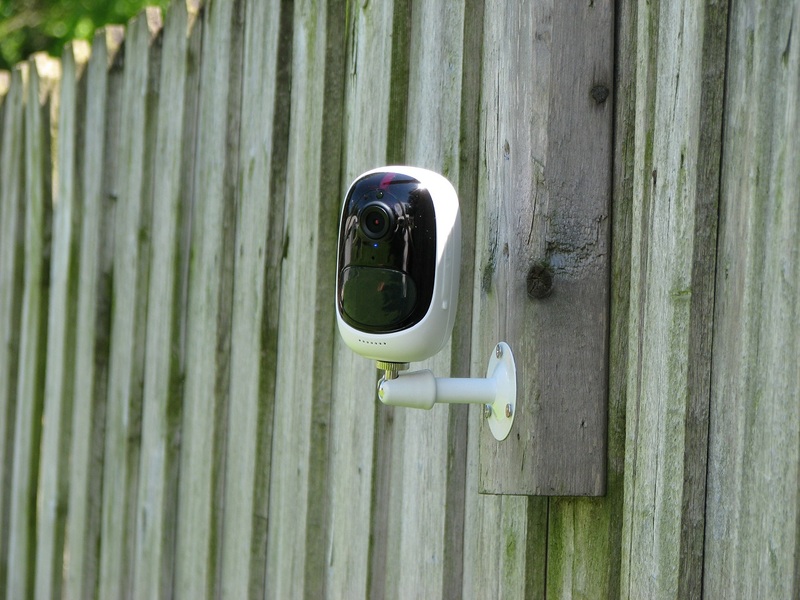 Motion detection, night vision, 2-way audio, no wires – there’s a lot in a small package. Great video and audio quality, with the option to save bandwidth if needed. The Reolink App is reliable, easy to use, and full of features. 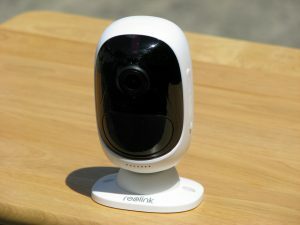 If you need a camera that records all of the time and is part of a larger camera system then the Reolink Argus may not be for you since it’s not designed to do that. If you’re using other Reolink cameras with the Reolink App though, this may be a good addition to fill in a hole. I’m using the Argus with my Reolink RLC-411WS that I did a review on earlier. They both work well together within the same Reolink mobile app. Need a small camera with no wires that you can move around, a baby camera, pet camera, nanny camera, etc. that you can view from your mobile device anytime? The Argus is perfect for that and it does it well. Where to buy the Reolink Argus? Click here to view the Reolink Argus at Amazon! Disclaimer – Reolink sent me this early production Argus camera at no charge in exchange for my honest and unbiased feedback, and I have tried my best to write an honest and unbiased review for you here as well. The Fluent stream is not 720p, it’s Q720p. And no where near 720p quality. Thanks for pointing that out, Dan. I remember seeing that Q on the Settings page when doing my initial review and then completely forgot to investigate it more. I just looked at it again in more detail and have updated that section of my review. I also see that higher frame rates are now available for the Fluent sub-stream than the 5 fps maximum that was initially there. My concern is that the area the cameras is to used in has wifi but no cell phone service. How will I be able to communicate and view remotely without direct cell service? Can I communicate via cell phone with the Comcast wifi router and thus communicate with the Argus cameras? HELP!!! 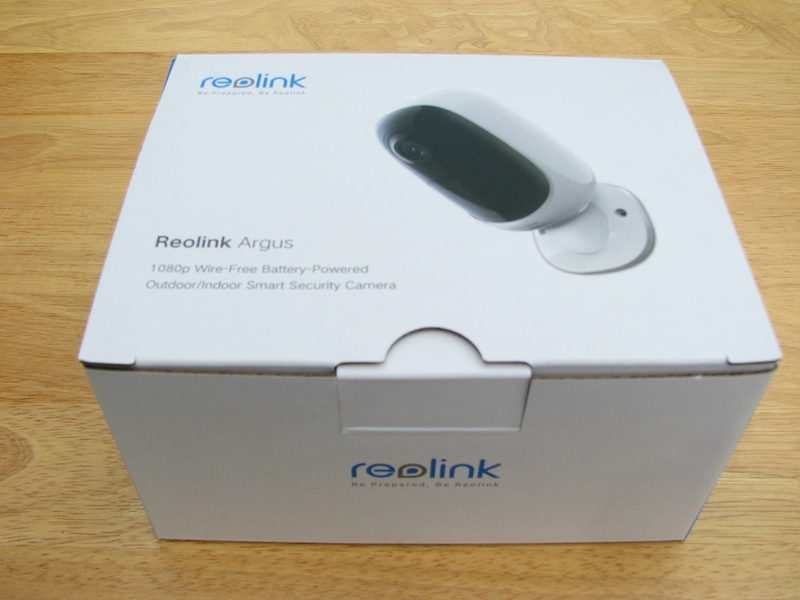 The Reolink Argus uses your WiFi, so you are good there as long as it’s in range of your Wifi signal. Your cell phone can access the Argus over any Internet connection, so if you can use your phone with your WiFi you will be able to access the Argus without cellular service. I think all newer smart phones can use WiFi. Of course you can also access the Argus over the cellular network when you are away from WiFi. If I order a camera now, when will I receive it. Thanks for any info. I just checked the Reolink website and it says they will begin shipping the Argus on July 20th. Hope that helps, you’d need to contact Reolink directly for any more detailed information. Just got my unit. Can’t set it up and I’m an engineer! Where is the easy setup? I have a laptop not a phone. I downloaded the app but it asks all kinds of questions like what is my root etc. I clicked on ‘add device’ as the voice says but doesn’t work. How is this easy? 2 hours and still not figuring this out! Hi David, sorry to hear that you’re having some trouble getting it going. When I was trying out my Argus it was not yet supported on the Reolink desktop application and was only supported on the iOS or Android mobile apps. It sounds like that’s still the case. 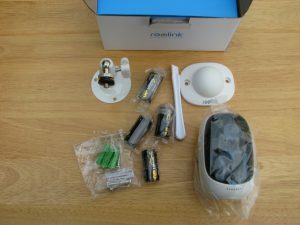 It is super easy to set it up when you have a smartphone and follow the quick start guide and voice prompts, and I think that Reolink designed it with the assumption that everyone using it would have a smartphone. Your best bet is to contact Reolink Support and see if they have a solution for you. Can you view on a laptop or PC ? I only see phone with android. Hi Jerry, I checked just a few weeks ago and the Argus is still not supported on the Reolink Windows application, so no way to view on a PC right now. At this time you can only use it with the Reolink Android or iOS apps. I am having issue and I am using a Samsung S8. Is it true that iPhone works better with this camera? The live view on my android doesn’t work half the time and cannot figure out how to video or what has been filmed…. Unfortunately I don’t have iPhone to try and I haven’t had any problems using Android myself. Contacting Reolink Support might be the best way to work through any problems you’re having.